A powerful applet that allows quick activation and configuration of the red filter and brightness provided by redshift. 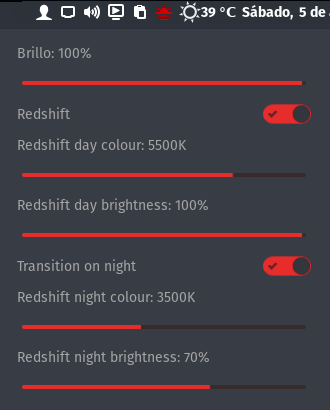 It supports manual change of the temperature and brightness which is not possible in the redshift-gtk and enable/disable transition between day and night. Debian/Ubuntu/Linux Mint and other Debian based distributions: sudo apt-get install redshift. Red Hat/Cent OS/Fedora: sudo dnf install redshift. 3) Enable the applet in cinnamon settings. Tooltip improvements with more information about the state of Redshift. Options for transition between day and night (oneshot option still available). Preferences are saved between computer shutdowns using the applet configuration (enabled on startup, temperature and brigthness remembered). Icon improved: black lightbulb for Redshift disabled, red lightbulb for oneshot mode and red sunset for transition between day and night. Thanks to @Martin1887 for his work on versions 2.0.0 and 2.1.0. Hello. Does this applet come with Mint and if so, in what sense? I've ended up utterly confused, what with `redshift`, `redshift-gtk` and seemingly two different applets, one of which gets marked by Cinnamon (in Mint 19.1) as problematic. Also, it would be nice were the applet to read and writing settings from the main redshift config file - but it seems not to do so. This applet shows a compatibility warning when one installs it on Mint 19.1. In contrast to ttjimera, I found the current version works fine in Linux Mint 18.3. It is also listed under "Downloads" in the Applets panel (the "Applets App?"). In case you rarely use that panel (like me), here's a tip: in the Manage tab you need to select the Applet you want to add to a panel and press the "+" to add it. Heh. The applet does not run on LM 17.1, Cinnamon 2.4.8. Which Cinnamon version is required as minimum, please? Dark icon, on the panel with a dark style - not visible at all. It should be noted that this applet - which might be admirable - is *not* part of stock Mint 18.3. That is: if one is simply trying to get Redshift, together with its panel indicator, working in Mint 18.3, then the applet presented on this page is not your man, so to speak. An awesome applet that provides GUI to configure redshift-gtk without having to pass command line parameters or edit the config file. Very convenient and useful. Only one imperfection I found. For more convenience I bound the command "pkill -USR1 redshift" (to enable/disable redshift) to a shortcut key. But the toggle switch on the GUI does not change accordingly when I used the shortcut.